The Orchards at Valley Ranch is an active adult community in San Antonio, Texas. With 88 homes upon completion, residents of The Orchards at Valley Ranch will be able to enjoy everything the community has to offer. Thanks to the numerous outdoor amenities, staying active and meeting new neighbors will be easy. Low-maintenance, modern homes make living in The Orchards at Valley Ranch a wonderful experience. At the center of the community is the 10,000 square-foot clubhouse. The exercise room is well-equipped to keep all residents in terrific shape. Homeowners can also get together in the open-air pavilion for a picnic or go for a walk along the community paths. Join a game on the basketball court or whip up a meal in the catering kitchen. On warmer days, a lap pool is available for those who want to enjoy a swim, as well as a waterpark that includes two spiraling waterslides. D.R. Horton began construction of The Orchards at Valley Ranch in 2017 and plans to build 88 single-family homes total. Homes range in size from 1,675 square feet to 2,245 square feet and have two bedrooms, two to two-and-a-half bathrooms, and an attached two-car garage. Some homes include features such as a courtyard and an optional fireplace. Whether residents choose to bike or just go for a stroll around the area, The Orchards at Valley Ranch offers a great environment for active adults. This intimate community provides an ideal setting for neighbors to mingle and meet new friends. Thanks to the homeowners' association, residents can pick up a hobby and explore San Antonio without worrying about community maintenance. 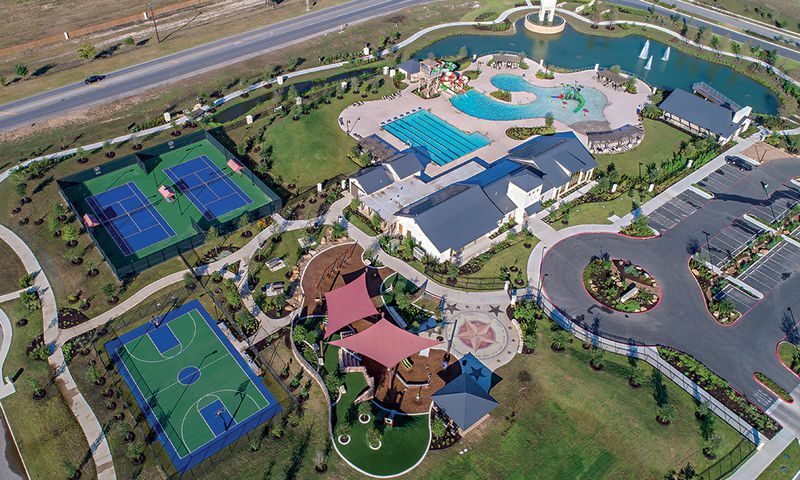 The Orchards at Valley Ranch is located near several destinations for outdoor recreation. For entertainment outside the community itself, homeowners can visit SeaWorld San Antonio, Government Canyon State Natural Area, and Oak Hills Golf Course. Residents of The Orchards at Valley Ranch are also close to any daily conveniences they need, less than five miles from Target, H-E-B Grocery, and Walgreens. When dining out, restaurants such as BJ’s Restaurant & Brewhouse, LA Crawfish, Mama Margie’s Mexican Restaurant, and Red Robin Gourmet Burgers can be found nearby. By car, downtown San Antonio is 23 miles from the community. For long-distance travel, homeowners can access San Antonio International Airport or The San Antonio Amtrak Station. With great activities inside and outside the community, The Orchards at Valley Ranch offers a wonderful place to call home to active adults in San Antonio, TX. Community Recreation Center - 10,000 Sq. Ft. Check back soon for more information on the lifestyle in The Orchards at Valley Ranch. The Orchards at Valley Ranch began development in 2017 and upon completion will have 88 homes. These homes range in size from 1,575 square feet to 2,245 square feet and offer two bedrooms, two or two-and-a-half bathrooms, and an attached two-car garage. Please Note: Floor plans are not available at this time. 55places.com is not affiliated with the developer(s) or homeowners association of The Orchards at Valley Ranch. The information you submit is distributed to a 55places.com Partner Agent, who is a licensed real estate agent. The information regarding The Orchards at Valley Ranch has not been verified or approved by the developer or homeowners association. Please verify all information prior to purchasing. 55places.com is not responsible for any errors regarding the information displayed on this website.